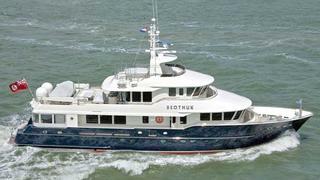 Hot news arrives as Maarten Ten Holter at Vripack Yacht & Ship Brokers says his joint listing with Chuck MacMahon at Northrop & Johnson, the 31.1m motor yacht Beothuk is now sold, with Chuck's colleague Michael Nethersole acting for the buyer. Vripack were responsible for her exterior styling and interior design and she is packed with facilities and comforts way beyond her size range. One notable feature is her luminous dining area in the forward position on the main deck. Beothuk accommodates six guests in three staterooms: a full-beam master suite, a double and a twin and was asking $12.9 million.